As we have entered into our 24th year of business, we will gladly serve you with all of your heating and cooling needs. Our employees thrive to offer custom comfort solutions to each and every client we serve. We look forward to serving YOU! 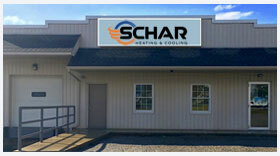 In 1994, Schar Heating and Cooling, Inc. began as a “one man show” providing installation of heating, cooling, and ventilation products to mainly the new construction market. After significant growth in both staff and equipment choices, today we happily offer many comfort products to homeowners and commercial businesses, while also continuing to serve contractors building new homes or buildings. We have a very talented crew. We have six comfort service specialists who can service your equipment with over 165 years of experience combined! Our sheet metal fabricator custom makes the pieces needed to make new equipment fit neatly into existing systems. The craftsmen who specialize in replacement and new homes demonstrate quality workmanship and conscientious installation. Customer comment cards come back to our office with praise for our employees! Schar Heating and Cooling, Inc. employees are here to help you! Our goal is to provide all of our residential and commercial customers’ custom comfort they can trust. We’re happy when you’re happy! We provide solutions for improving the interior environment of an establishment as well as achieving energy savings. Call us with your problems. We’re here to serve you.